Today I am bloggin about my DT card for the new challenge starting at the Craftymessers Challenge Blog today. 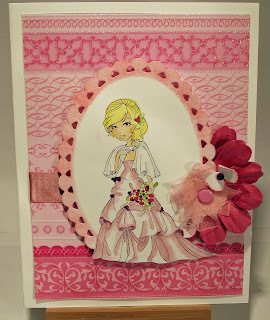 The theme chosen by my teamie Gemma is Pink and Cute and the DT team have been given some Sassy Studio Designs digi stamps to use to create the DT projects. Sassy Studio Designs are also our sponsors for this challenge and the winner gets 4 digis from the Sassy Studio range. I chose this image to make my card. I printed the digi-image onto white card and coloured the 'princess' using my Copics markers. I used a Nellie Snellen scalloped-oval die, taking care to cut the bottom of the dress clear of the die to give the image a frame. Paper from the DCWV 'The Glittersweet' mattstack was used to matt the cut-out image and it was then adhered to a white cardbase. To embellish the card front I made a pink flower from some organza ribbon and a pink brad and a deep pink.paper flower from Reyher. A punched out Butterfly in white with a pink gem in the centre completes the card. Thanks for stopping by to read my blog and don't forget to pop over to Craftymessers Challenge Blog to see the other DT projects and maybe join in too! Don't forget to leave your comments and have a great day !